Who is this Jess Taunton girl? Jess is an experienced wilderness guide and keen photographer. Now 23 years old and living in Sydney, her first photography award kick started her passion in photography and being a young Girl Guide with a sash full of badges fuelled her obsession with the outdoors. Since then she has had photos published in 'National Parks and Wildlife' pamphlets, wedding magazines, Australian Geographic Outdoor and, partnered with Chris Bray, helps run photography courses all around Australia and New Zealand. 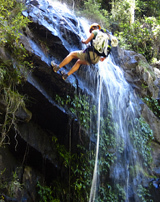 Jess has also worked extensively with Australia's leading provider of experience based outdoor education, "Southbound Adventures. After finishing high school in 2005, Jess volunteered at a Girl Guiding Activity Centre over in England which included formal 'instructor level' training in kayaking, canoeing, climbing, abseiling and archery. After working the 2006 English summer, she spent the remaining 6 months of the year honing her adventuring skills all across Europe - enjoying hiking in Scotland and France, canyoning in Budapest, white-water rafting in the Czech Republic, as well as mountain bike riding and bush walking in the Black Forest in Germany. These experiences cemented her love of the outdoors and a desire to learn about the diverse cultures and societies of the world. So, in 2007 Jess commenced a Bachelor of Social Science at Macquarie University back in Sydney, majoring in Anthropology. During this time she worked with local outdoor education centre 'Challenge Ranch' on the Central Coast. This role - involved everything from leading numerous caving expeditions and managing groups of sometimes socially disadvantaged children in the outdoors - significantly developing her leadership and teamwork skills. Jess completed her PACI (Professional Association Climbing Instructors) climbing qualification in 2008, and later went tramping in New Zealand's South Island and cycled her own 1,300 km route around Tasmania with her partner Chris Bray. After completion of a four day 'Wilderness First Aid' course in 2009, Jess's outdoor career took a step up, becoming a group leader with 'Southbound Adventurers'. 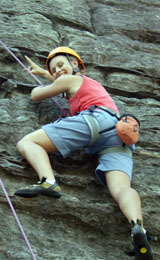 Her role involves leading small groups of teenagers on weeklong expeditions, encompassing anything from hiking, canoeing, kayaking, mountain biking as well as activities such as abseiling and rock climbing. Here she continues to refine her group speaking skills as well as her organizational, group management and time and resource management skills, while also maintaining the physical and emotional stability of her clients. Beyond simply advancing her own skills, this job honed her passion for sharing outdoor experiences with others. Jess finds it personally rewarding working with youth and watching their confidence, resilience and self esteem boost during the week as they overcome challenges. In the winter of 2009, Jess completed a three month internship at 'Yuendumu' - an Indigenous community, 300 km out of Alice Springs. Here she immersed herself in community life, working at 'Warlukurlangu Art Centre', as well as coordinating youth programs at the 'Mt Theo' youth center. This experience certainly pushed her outside her comfort zone, and was a real eye-opener in terms of cultural differences. After completing the internship, her partner joined her for a three week 4WD trip around the Northern Territory - including seeing Lake Eyre in flood. Returning home she had the opportunity to practice her marketing and promotional writing, when merino garment manufacturer 'Icebreaker' asked her to write a product endorsement, which subsequently featured on their website. 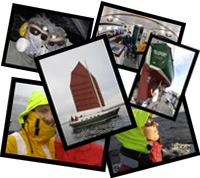 Looking to the future, in July 2010 Jess is embarking on a world first expedition with Chris, sailing 'Teleport' - a 29' junk rig yacht - through the 'North West Passage' across the top of the Canadian Artic - if successful it'll be the first ever junk rig through the passage! This undertaking is the perfect vehicle through which she is looking forward to taking her adventures one step further - for a start, learning how to sail - and hopefully encouraging and inspiring other young women from around the world to engage in outdoor challenges and their own adventures as she shares her experiences along the way.